Seventy members from 15 chapters around the state gathered in Albany yesterday to deliver a unified mes sage in support of K-12 public school facilities and grounds. Directors of Facilities attended more than 105 appointments with lawmakers or their staff. 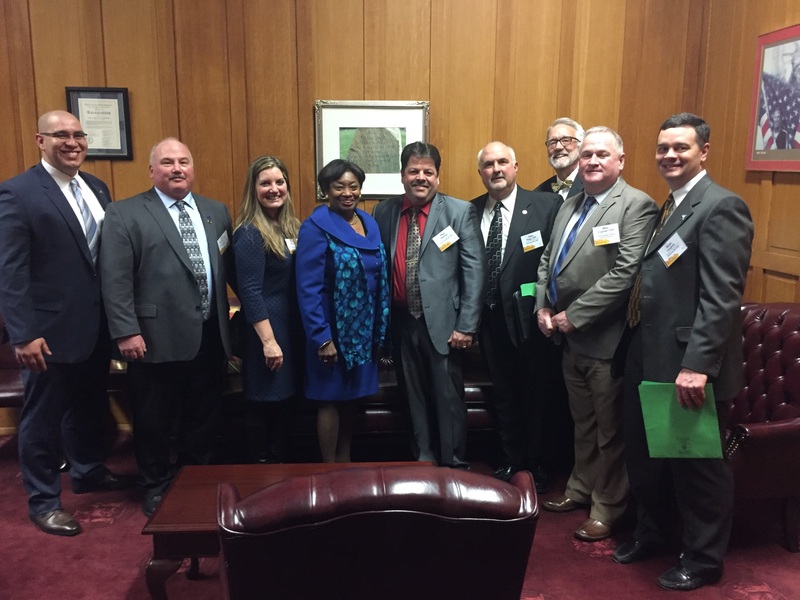 Before heading to legislative appointments, Association President Keith Langlotz drove home the importance of our state's school facilities directors having a presence in Albany every year. He encouraged members to keep up the conversation back home, and thanked associate members for their support as well. Legislative Chair Fred Koelbel said the Association's annual presence in Albany is now recognized by lawmakers, policymakers and coalition partners. He reminded participants that it was not that long ago that only a few leaders knew who we were. 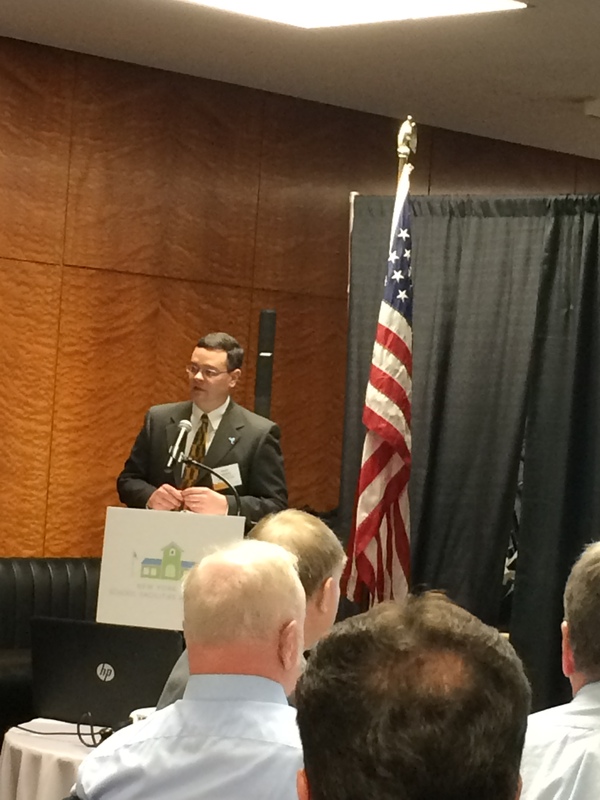 NYSSFA is now testifying at hearings, meeting with lawmakers every year, and being sought out on issues. Heather Evans and Jim Carr, legislative analysts from Hinman Straub, presented summaries of the legislative priorities, as well as talking points and recommendations for navigating the appointment process. Members shared the photos they took with the lawmakers during the day. Visit the SFA twitter platform to view the day's photos and the Association's advocacy in action. Please retweet! The next SFA webinar, Managing Nuisance Geese, is scheduled for Thursday, March 30 at 12:00-1:00pm. Register here. Although beautiful in flight and valued as a symbol of the wild, Canada Geese frequenting school grounds, including athletic fields, are a growing concern. Please join us for a discussion about goose biology and behavior, the legal framework for dealing with goose problems, alleviation techniques available to schools, and the long-term management of geese and goose problems. Flocks of Canada geese are said to cause turfgrass issues such as compaction, weed seed dispersal and nutrient loading. Learn the issues and best management practices to overcome them. 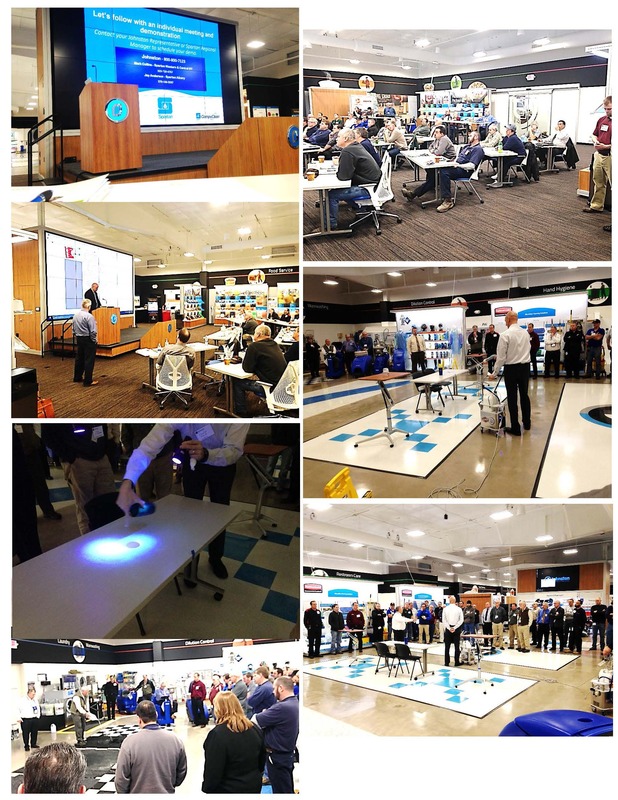 At its February meeting, the Mid-State Chapter included valuable training about Cloud-Based Custodial Management Software, along with a demonstration of new elec trostatic disinfecting technology. Custodial training videos were also available. The event was held at the new Johnston Food Service & Cleaning Solutions Facility in Auburn. The next Chapter meeting will be Thursday, March 16 at 9:30am at Pasta’s On the Green at FoxFire Golf Course, 1 Village Blvd North, Baldwinsville. This meeting will include special Ground Keepers' training, provided by Cory Jenner from Appel Osborne Landscape Architects, and will cover storm water systems design and proper maintenance. February was a busy month for the Mid-State Chapter! 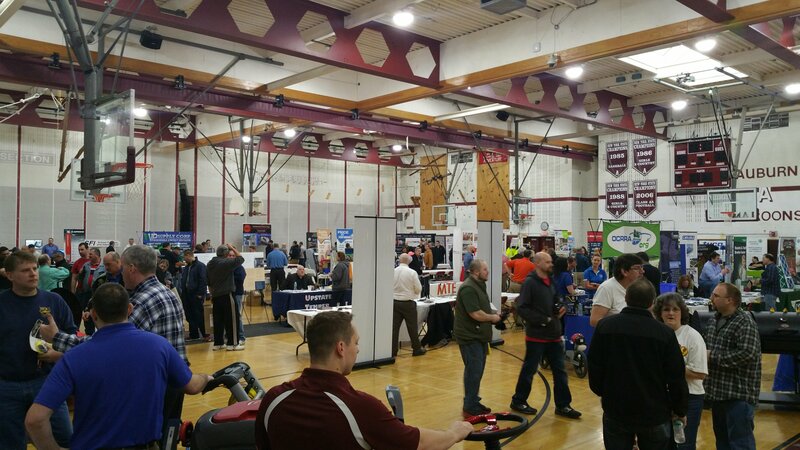 On February 24th, they held their 21st Trade Show and Workshop event at the Auburn High School. There were 27 schools in attendance, over 425 total attendees, 20 workshops offered, and 74 supporti ng vendors. This trade show grows every year! The Chapter has already started to plan next year’s event. Special thanks to Larry Garuccio, CDF from Auburn Schools and his Secretary Donna Porter for all their hard work on this amazing event. They screamed it: “$823,614.91.” And suddenly last year’s total fell. At a little past 5 p.m. Saturday, about 22 hours into the South Glens Falls High School Dance Marathon, the 50/50 raffle was up to $50,000, the Stewart’s ice cream stand had sold about 90 gallons of ice cream, the hair stylists with the Cut-a-Thon had given 110 haircuts and the student dancers in the main gym were still dancing. “It’s exhausting, but knowing this helps the recipients keeps me going,” said Kaira Smith, a senior who had been dancing since the night before. Generation after generation of dancers come back to the event that has raised millions in its decades-long history. In 2016 alone, it raised more than $760,000 to help people in the community. Dianne Bean was a dancer, her daughter was a dancer and for the past 17 years she’s been coming back to cut hair in the Cut-a-Thon. “It’s a love of community and we want to give back,” she said, adding that unless you’ve actually experienced it, it’s hard to explain the feeling. Kingston Mayor Steve Noble hopes to arrange a meeting with people who have expressed concern about the traffic pattern changing on Burhans Boulevard as part of the “Safe Routes to Schools” project. Noble said he would like to meet with Alderwoman Lynn Eckert, D-Ward 1, and concerned residents before the March 22 meeting of the Common Council’s Public Safety/General Government Committee, when the matter is to be discussed. Burhans Boulevard, a short street that connects Lucas Avenue to Alcazar Avenue near Forsyth Park, is in Eckert’s ward. Noble, who was instrumental in securing grant money for the Safe Routes project before becoming mayor, said other parts of the initiative will progress. 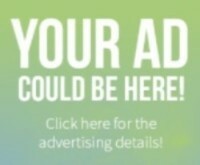 With the new showcase ad, business partners submit a logo or photo and also a paragraph of text for this advertising spot. Click here for more details outlined in our Media Kit.